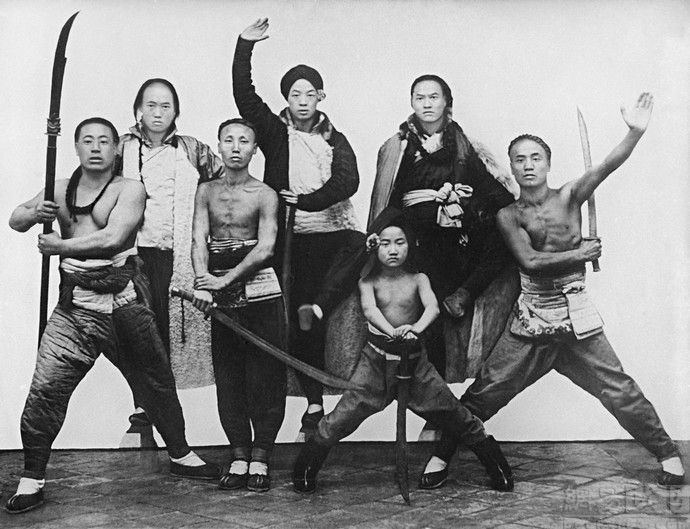 What Does Martial Arts Studies Owe the Kung Fu Community? -Victor Turner, The Forest of Symbols (1967, p. 150). If culture is understood as a system of interlocking signs, a complex of meanings, beliefs and practices that function as “man’s adaptive mechanism” in an ever changing world, it is hard to ignore the power of words. Nor can we deny the centrality of memory as communities grapple with the twin problems of meaning and power in the complex societies in which they are embedded. Indeed, the keeping and perpetuation of this collective memory is often a highly charged topic. In some instances anyone is free to enter the fray, while in other situations only certain individuals have a legitimate right to curate or interpret this corporate knowledge. The saying that “knowledge is power” is not simply a truism. It is a profound reality that every politician, social reformer, religious leader or community organizer is forced to wrestle with. The “problem” with knowledge is that it knows no boundaries or borders. It is nearly infinitely reproducible, and yet ever so prone to mutating in unpredictable ways. It is perhaps the most slippery of all forms of human capital. And yet it is vital. Nowhere are these possibilities and dilemmas more obvious than in the realm of martial arts studies. Often there is a tendency to get too caught up in the minutia of an individual study, to focus strictly on historical issues in a certain dynasty, to write a paper that discusses only folklore, or to look exclusively at problems of agency and embodiment in the gym. More rarely in the academic literature, fraught as it is with preexisting theoretical debates and publications pressures, do we step back and take a look at the big picture. Yes, every martial artist is indoctrinated into a certain understanding of history, just as their bodies are trained to echo the sedimentary deposits of previous social, national and economic upheavals. But there is almost always something more at stake. These are simply two (self-reinforcing) sides to the same coin. A close reading of both embodied practices, or patterns of esoteric cultural transmission, lead to the same set of questions. Given that the martial arts are voluntary actives, why do individuals seek out these often difficult, painful and expensive practices? How do they contribute to the creation of new “adaptive mechanisms” in the actual lives of the individuals who practice them? Or to put the question slightly differently, why do some people choose to become experts in “martial culture?” What social situations do they emerge from, and what do they hope to accomplish? Lastly, how does all of this change when we add the figure of the anthropologist, social scientist or historian to the mix? What happens to a community when a new source of information or memory becomes available? This question is especially interesting as the sources of legitimacy that gives credibility to an academic project are often quite different from anything available to the more traditional teachers and masters of the art. Nor are most of the authors writing in these area’s pure outsiders or “armchair theorists.” Many of them can draw on years, if not decades, of personal practice as they draw up their theories. And yet these academic projects, while bringing a certain type of recognition and transparency to the art which many will find helpful, are almost always focused on questions different from those that consume the attention of most practitioners. What responsibilities, if any, do students of Martial Arts Studies bear towards the communities that they study? More specifically, should we strive to produce academic work which (while not compromising its basic integrity) is both intellectually accessible and physically available to the communities that helped to produce it? In short, as D. S. Farrer recently asked, does martial arts studies have a responsibility to engage in “studies with” our key informants rather than simply “studies of” questions that motivate only the academy? I should say at the outset that this is a question that has arisen from time to time here at Kung Fu Tea. Paul Bowman has already argued that hand combat practices imagined within the confines of academic theory will always, by necessity, be a distinct “disciplinary object” and hence bound to disappoint most practitioners. And I think that his answer basically holds true for many higher order discussions that seek to problematize the practice of the martial arts using the tools of philosophy, cultural theory or even broad overviews of social history. Yet to my mind these questions become much more pressing when we look at a different class of research projects. Do our responsibilities change when we instead switch to detailed discussions of specific and recognizable communities? Anthropologists concerned with the ethics of field work have long wrestled with the responsibilities that exist between an ethnographer and his informants. Likewise sociologists and historians who focus on specific communities often find themselves being called upon to explain key events to outsiders or to act as advocates in times of crises. In my reading of the literature it seems that the idea that one can maintain an objective relationship with the community being investigated has long since passed. Advocates of reflexive ethnography have instead demonstrated the value of turning the lens back on the researcher to expose some of her possible attitudes and biases as she moves through the process of learning as a better interim solution to these dilemmas. Yet are there advantaged to going beyond these simple exercises in reflexivity and considering that perhaps the subjects of one’s research should also be part of the audience that one is writing to? What would this look like in the field of Martial Arts Studies? A typical market place demonstration featuring socially marginal martial artists. It is not uncommon to come across an interesting idea when sitting down to read a recent publication in the Martial Arts Studies literature. Yet in my experience the much more important ideas begin to flow when (through happenstance or poor planning) you find yourself reading two totally unrelated texts at the same time. Over the last week I have made a couple of futile efforts to sink my teeth into Prof. Lee Wilson’s recent book Martial Arts and Body Politic in Indonesia (Brill, 2015). I had been looking forward reading this book for a while. After all, there are not that many other individuals coming out of political science departments who are writing on the martial arts. And so far I have really like what I have seen. Unfortunately I haven’t actually managed to read all that much in absolute terms. This is mostly my own fault as I have been spending lots of time on the road, in the gym and working on other projects. But in all fairness, it is also clear that this book is not going to be an easy read. The basic ideas behind the text are fairly accessible, and the author is engaging with theorists (Geertz, Anderson, Foucault) that most political scientists, anthropologists and social theorists will already be familiar with. Indeed, these names have all come up in the course of a well-developed debate on the nature of power in the Indonesian state, and Wilson makes an impressive argument that a better understanding the historical development and practice of Penak Silat can actually bring clarity of this ongoing conversation. In itself this is very exciting. It is great to see Martial Arts Studies being used in a sophisticated way to clarify a high profile discussion with broad theoretical implications for a number of fields. I think that many of scholars will probably get a lot out of this book. Yet I doubt that many practicing martial artists will walk away from it feeling equally excited and invigorated. Admittedly, I am only two chapters into the project, so it may be too soon to judge, but this is a text that never fails to use abstract jargon when a clear statement of a simple idea could have sufficed. Again, the basic thrust of Wilson’s argument is not all that complicated, yet it is protected by a disciplinary fence that seems almost designed to keep the (academically) uninitiated out. This struck me as rather odd. And it is interesting to stop and consider why. I am no stranger to baroque jargon. It is the stock and trade of academic writing. From the “R values” of statistical research to the canon of critical theory, most scholars end up becoming “multi-lingual” just so we can read all of the articles, written from different theoretical perspectives, in a single issue of our favorite journals. Judged by these standards the jargon in Wilson’s book is not particularly remarkable. If anything it reads a bit like a dissertation. It wasn’t until I picked a totally unrelated book that my concern started to come into focus. In the Company of Man: Twenty Portraits of Anthropological Informants (Harper, 1960) is a now classic collection of chapters in which a prior generation of anthropological theorists wrote what amounted to personal essays discussing their relationships with, and the contribution of, their key informants. One can almost think of it as a forerunner of the more “confessional” school of ethnography that later became popular. Muchona was also one of Turner’s most knowledgeable and important informants. In this essay Turner reflects on his friend and colleague, asking what made Muchona an expert of esoteric Ndembu religion and medicine. Certainly he was philosophically minded. That is important. Most western anthropologists spend their lives investigating a class of highly abstract questions that their fellow countrymen care little about. Is it so odd then to discover that the average Ndembu farmer, school teacher or office worker also has relatively little interest in this same class of issues? Almost by definition a good informant is someone who is an expert on things that most people do not care for and know little about. We have a word for such people in the social sciences. 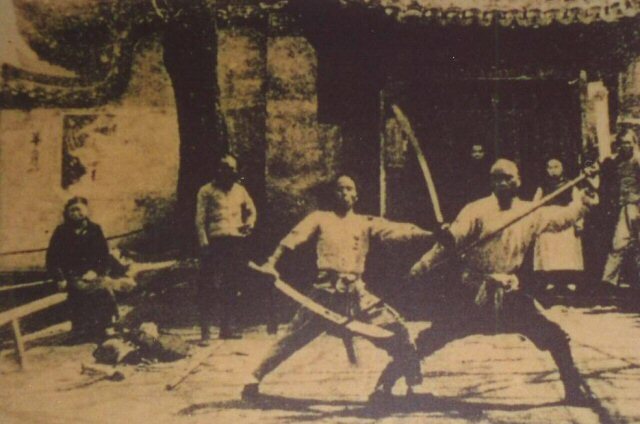 They are described as being “marginal.” Indeed, no concept has been tossed around in discussions of the Chinese martial arts with quite as much vigor as that of marginality. How do individuals come to be seen as marginal? Do the martial arts act as pathway out of economic marginality? Or do they in fact reinforce an individual’s social marginality? Can Kung Fu be understood as an alternate pathway for self-creation for marginal teenagers? Turner’s essay is deeply human and moving. It’s a profound reminder that there is almost always an emotional cost associated with really getting to know another person. But it is also a brilliant discussion of why marginal individuals, specifically those who sit both inside and outside the dominant social institutions of life, are so often exactly the sorts of informants that an anthropologists needs. Muchona’s story is instructive in this respect. To begin with he was not actually a fully accepted member of the tribe that he lived with. He and his mother had been captured in a slave raid while he was a child. Muchona had an unusually close relationship with his mother, and it was she who had insisted that he be inducted into a number of medical groups as a child. Yet she died young leaving him to negotiate a life of slavery. At about the age of 30 Muchona managed to buy his freedom and established a career as a healer among the Ndembu. He moved through a number of communities and was thus exposed to a variety of local languages and cultural systems. This gave him a comparative understanding of the area’s beliefs that most of his fellow villagers did not share. Nor was his intelligence (which Turner informs us was truly great) always appreciated by his neighbors. Muchona managed to carve out a niche for himself as an expert in esoteric matters. Yet the better elements of local society always looked on him as both a buffoon and a potential threat. Turner’s sudden interest in the village “Witch Doctor,” and his extensive patronage of someone who was clearly “socially inferior” (even if he was also an acknowledged religious and medical expert) did not do much to improve Muchona’s social position. In fact, it even led to some instances of tension and a witchcraft accusation towards to the end of Turner’s stay in the community. It is clear from this essay that Turner wrestled with the ethical implications of this relationship with Muchona. What had started out as a simple matter of economic exchange (Turner payed Muchona-who was a religious professional-for the tutelage needed to complete his research) quickly became a friendship. Muchona himself may have learned quite a bit about the anthropological method from his work with Turner. He probably acquired a new set of concepts including ideas like “culture” and “symbolism” (as used by anthropologists). Not only was Muchona teaching Turner about Ndembu religion, but as he answered questions, organized lectures and discussed the material with someone from a different background he learned to understand his own society differently. In a simple sense we might say that Muchona was made complicit in the project of objectifying his own society. That is certainly true as far as it goes. But Turner also notes that the depth of his understanding of this material evolved as the relationship progressed. Why? Muchona the Hornet gained a new asset, something that he had never had before: a student and a friend. Whereas the villagers saw him as essentially a specialized (and low-caste) craftsman, when he was with Turner Muchona became a philosopher. Suddenly he, a marginal individual, was empowered to act as the interpreter for Ndembu religion. Of course Muchona was never a fully accepted member of Ndembu society. He was always a bit of an outsider. Yet it was that exact quality that provided him with the motivation to really wrestle with what he saw in the local environment. Turner’s return to the world of writing and teaching ended his relationship with Muchona. As his essay makes clear he was worried as to what would become of his friend and fellow student of religion. With Turner, Muchona had been a philosopher who had come to see his world differently. What would happen when he was forced back to being the village “Witch Doctor?” Turner had gleaned critical insights from his informant, but at what cost? As a personal essay I think that this is a brilliant piece of writing. But equally important is its role in foreshadowing a weakness with the sorts of overly “confessional” ethnography that would follow in the coming decades. So much of this essay focuses on Turner’s relationship with Muchona, and even his feeling about certain events, that it fails to take into account some more fundamental structural issues which can be seen emerging from behind the corner and the cracks of his narrative. To begin with, Turner’s relationship with Muchona was always mediated by two other figures. They are the ones who we must look to in order to answer the fundamental question that this post starts off with. The first of these figures is a local social and political informant named Kasonda. He has a long standing dislike of Muchona, a low status member of his own community, which he expresses in the form a vicious rumor campaign. The other figure is named Kashinakaji. He is almost invisible in Turner’s account, yet he is actually the linchpin of everything that follows. Kashinakaji is both a Christian and the senior teacher at the local mission school. This provides him with a healthy amount of social clout as the Ndembu villagers fully appreciate the value of a solid education in their children’s prospects for getting ahead in the world. Yet Kashinakaji enters our story during a crisis of faith. As a child he was totally isolated from the “pagan elements” of his own culture. Lately he has started to ask uncomfortable questions about the larger workings of the mission system and has started to doubt the Christian talking points on the value of the local traditions. It is he who decides to initiate a study of local religion, he who introduces Turner to Muchona (who had only seen him once before in passing), he who provided the actual translation of these discussions and he who smoothed over the situation with the local villagers when Turner’s interest in Muchonda raised suspicion. And while Turner and Muchonda may have recognized each other as fellow travelers on the esoteric pathways of religion and ritual, Kashinakaji also developed a sympathy and respect for his fellow villager. The one disappointing aspect of Turner’s essay is that it focuses so tightly on his personal relationship with Muchonda that it fails to recognize that a more fundamental shift is in progress. Was Muchonda really left alone and marginal when Turner left? Probably no more than he ever was. After all, during the preceding months he had acquired a powerful new friend and supporter in the form of Kashinakaji. Kashinakaji’s influence in the community, while substantial, was probably limited by his lack of understanding of his own culture. Yet he gained tools for thinking about culture in abstract terms from Turner, and a huge body of more specific knowledge from Muchonda. And Turner’s involvement in these discussions was really only possible because there were other individuals in the community who were increasingly interested in these same matters who invited him to participate in the discussion since it facilitated what they were already planning on doing. At the time that Turner left Muchonda was already an older and somewhat sickly man. It seems entirely possible that his story might not have had a happy ending. Yet was he more marginalized because of his contact with Turner? Clearly the answer has got to be no. The pushback from the villagers that Turner describes (somewhat deflected by Kashinakaji) is actually pretty good evidence that the status quo had been upset. More importantly, Muchonda had become part of a conversation that could possibly have far reaching effects, regardless of what the final few years of his own life held. 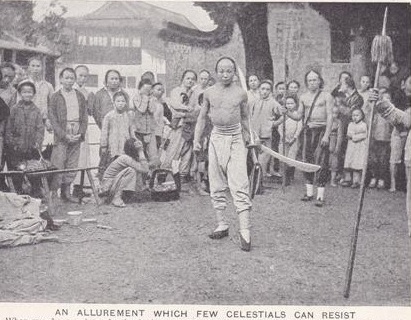 A martial arts performance at a marketplace in Shanghai, circa 1930. Source: Huan Fei Hung Museum. While the details are unique, the basic structure of this narrative should sound familiar to many students of martial arts studies. Hand combat teachers are frequently (though not exclusively) marginal individuals living on the edge of their own communities. This is often the case in China, and even throughout South East Asia. While martial values may be seen as important in the abstract, for both cultural and tactical reasons the individuals who convey them are often viewed as somewhat “expendable” by the rest of society. While lacking the dramatic backstory of Muchona’s childhood in slavery, this means that many martial artists are also by necessity “inside outsiders.” They are forced to navigate multiple competing cultural systems (or perhaps multiple interpretations of the same set of cultural values). While many individuals may never stop to think about these issues in explicitly philosophical terms, some will. And Victor Turner’s essay should help to remind us that their insights may be critical to not just understanding the details of martial arts culture, but the larger social systems that it is embedded within. In fact, as I was rereading the details of Muchona’s life I could not help to notice so many parallels with informants who have helped to advance the discussion of the martial arts. This brings me back to the first few chapter of Lee Wilson’s book. I think that the robustly academic nature of his writing stood out to me because so much of what we see in martial arts studies is written with a dual audience in mind. Certainly we expect that most practitioners of a given style will ignore what we write on it. For most individuals the academic discussions of the culture, history or sociology of the martial arts are not all that relevant to their actual practice. Yet we all have our own Muchona. Those of us who have immersed ourselves in specific communities for years at a time have found fellow travelers on the martial way who share not just our passion for practice, but our hunger for understanding what it all means. For that matter, many of us have witnessed the growing excitement when a key informant discovers that their interest in the martial arts suggests other historical, cultural or philosophical areas for exploration. Indeed, a hunger to find meaning in life has drawn many individuals to the traditional fighting systems, just as it has to the other systems of esoteric knowledge that anthropologists, like Victor Turner, have studied. One might argue that there is a danger in empowering the Muchonas of the world. They are, after all, marginal individuals. Their interests, like those of the Martial Arts Studies researcher, likely do not reflect the actual beliefs of the community in practice. I can write any number of essays stating that the “Red Boat Opera Rebels” are basically historical fiction and it won’t really affect anything that happens in a given Wing Chun school. This folklore is just too essential to the identity of the art. Or is it? Maybe the greater anxiety is that as academic narratives enter the mainstream, and as the Muchonas of the community are progressively empowered and heard, we will increasingly feel their sting. Will the academic study of the martial arts fundamentally change them? Could the demystification of these communities even hasten their eventual demise? Again, these are questions that anthropologists and sociologists have dealt with for some time. Even some historians have increasingly become suspicious that no matter how much time they spend in the archives they fundamentally end up writing books about the future rather than the past. Turner’s essay is instructive on this point. Reading between the lines it is clear that he has entered Ndembu society at a time of change. While his work focuses exclusively on Ndembu religion, powerful members of the community are Christians and have been for some time. Yet the mission system is showing signs of strain, and suddenly there is new interest in esoteric knowledge. This reminds us that culture is not a static thing. Only in that way can it fulfill its role as an “adaptive mechanism.” The ability to adapt and change is a feature rather than a bug in cultural systems. And it is this underlying process of change that point to Kashinakaji the school teacher, rather than Muchona the local expert or Turner the anthropologist, as the central figure in the entire episode. It is Kashinakaji who is struggling with what it means to be Ndembu in the post-colonial period. Turner will leave and at some point the older Muchona will pass on, and it will be Kashinakaji’s responsibility to take what he has learned, adapt it to the circumstances that he finds himself in, and relate some elements of it to the community at large. This is a question that must be answered by each generation for itself. Indeed, the survival of the enterprise depends on it. It would be foolish to think that our era is somehow uniquely exempted from the task simply because we have better technical tools to “preserve” the past. The question at hand is really one of social meaning. While insightful I doubt that the work of martial arts historians and anthropologists actually contain the answers to these questions. It will be up to a new generation of reformers, teachers and entrepreneurs to work this out for themselves within their local communities. Yet a better understanding of the fundamental social, cultural, economic and political forces at work may be a precondition for better decision making. Properly understood, comparative and historical accounts can offer models of both success and failure. Many of the individuals who engage in these sorts of participant-observation ethnographies count themselves as serious members of the communities that they study. The development of reflexive ethnography suggests that a certain involvement in promotion and growth of these pursuits may ultimately be both acceptable and ethically laudable. Making a conscious effort to produce academic studies that are accessible to certain members within these communities may be one of the best ways to accomplish this goal. While many of us find ourselves writing, at least in part, for our own personal Muchonas, we cannot neglect the more important task of reaching out to the Kashinakajis of the coming generation. As the layers of social marginality around the martial arts are deconstructed, the University may yet play an important role in the advancement of these “traditional” systems of knowledge.